An Unaju: unagi (eel), steamed, grilled, and basted in a special sauce. Served on rice in a laquer box. 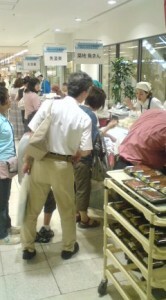 Each summer in Japan, usually in mid or late July, you will find that department stores and COMBINIs (convenience stores) have set up special displays and counters for promoting and selling ready- to- eat, steamed and grilled UNAGI (eel). At the same time, banners advertising these succulent, snake-like delicacies, can be seen lining the roads leading to shops and restaurants which specialize in them . Even those who are JAPANESE ILLITERATE can clearly make out what is being touted by these fluttering NOBORI (flags), as the U (う), which is the first syllabic character used to spell UNAGI is printed in a long, exaggerated line (often with a head and a tail), forming the shape of an eel! You may ask what this is all about? Your Japanese friends or acquaintances will probably give you the SIMPLE , STANDARD explanation- that eating nutritious eel helps you beat Japan`s notorious summer heat, and keeps NATSU-BATTE (summer lethargy) at bay. They will also tell you that it is customary to have UNAGI ( usually served on rice and in a distinctive sauce) on a specific day, traditionally said to be the hottest of the year, which is called DOYO NO USHI NO HI (土用の丑の日), and which literally means the Day of The Ox During DOYO ( in 2011 this will be on July 21st). Now all of this is clearly understandable and perfectly correct. But for those you who would like to delve deeper into the roots and significance of this extremely popular custom ( you can bet that I have MY eel every summer! ), I would like to explain just what DOYO (土用) means, why the Day of The Ox (丑の日) during the DOYO is significant, and then, why it is EEL that has become the most popular TONIC for that day. I will also show you that there are alternative foods for those who have not developed a taste for UNAGI (or its distinctive shape). Let me begin with the basics. The traditional Japanese calendar consists of 4 perfectly balanced, 90 day seasons, with the official first day of each season falling between the solistices (the longest and shortest days of the year) and the equinoxes ( the two days in the year in which daytime and night-time are equal). Accordingly, the first day of spring (RISHUN, 立春) is half-way between the winter solistice (TO-JI, 冬至) and the spring equinox (shunbun no hi, 春分の日), the first day of summer (RIKKA, 立夏), is between the spring equinox and the summer solistice ( GESHI, 夏至), the first day of autumn (RISHUー, 立秋) between the summer solistice and the autumnal equinox (shubun no hi, 秋分の日), and, likewise, the first day of winter (RITO-, 立冬) lies between the autumnal equinox and the winter solistice. As I have mentioned above, there are 90 days between each of these official seasonal changes. Doyo (土用), according to the traditional calendar, is the 18 (or 19) day period before EACH seasonal change day. And though, as you now know, there are actually 4 DOYO periods in a year, most contemporary Japanese now associate this expression ONLY with the summer. To understand the etymology and significance of the term DOYO (土用), which contains the Chinese character DO (土), meaning earth, or soil, we have to look at traditional Chinese Yin Yan (陰陽) Theory and more specifically the concept of the 5 elements (五行) which has had such a great impact on Japanese thought. According to this way of thinking, most things in the world can be associated with either YIN (the passive) or YANG (the active), OR with one of the five elements. These are: wood, fire, earth, metal, and water. Each season, of course, is also associated with one of these elements- spring with wood, summer with fire, autumn with metal, and winter with water. As you can see, there are only four seasons, so what about the fifth element- earth? Well, traditionally this became connected to EACH period of seasonal change. That is why this 18 day period, which comes four times a year, is the earth period. According to these beliefs, one should not engage in any projects which upset the earth (digging a well, etc) during these DOYO periods. Now that we understand what DOYO means ( and PLEASE remember that I am only giving the scantest explanation of EXTREMELY complex traditional concepts), lets look at what The Day of The Ox is, and why that day is considered to be of special significance. If you look at a Japanese calendar (even today) you often find that printed on it each day of the year has, in order, one of the TWELVE ANIMALS OF THE CHINESE ZODIAC ( junishi, 十二支), just as each consecutive year has. These animals are- RAT, OX , TIGER , RABBIT , DRAGON , SNAKE , HORSE , SHEEP , MONKEY, ROOSTER, DOG ,and BOAR. The characters used to represent these animals as zodiac sign are DIFFERENT from those we use to represent the actual animals. That is why Day of The Ox, is written 丑の日, with 丑、as cow or ox, and not the more familiar (to basic students of Japanese) character: 牛. Since Doyo periods are usually 18 days long and there are twelve zodiac signs, it is quite common for a DAY of The Ox (ushi no hi) to occur not only once, but twice within that period (Im not good at math, but you can do the calculations yourself). The questions remains as to WHY the ox would be of special significance during the summer DOYO. OK. This period has traditionally been the hottest time of the year in Japan. Those of you who have experienced this overwhelming heat and humidity know how it can sap you of all your strength and knock you out of action. The ox is significant in that it can act as a COUNTER-BALANCE to the summer heat ! Here is why. Not only each day and year, but also each month is designated its own zodiac sign. The sixth month of the old calendar ( usually July) is Month of The Sheep (未). Directly on the other side of the year , is the frosty 12th month (usually January). The zodiac animal of this, the coldest of months, is the OX ! In other words, the the cold bearing powers of the ox are called forth for assistance when the year is experiencing its hottest days ! In Ying Yang thinking FINDING THE BALANCE is always important, and the Ox help to level out the sheep! Now you see why the Ox Days are significant during the summer DOYO. But why has eating eel been so popular on these days? Again, the explanation is not simple. It seems that there has long been the belief that any food beginning with the syllable U (as in ushi- cow), would bring relief from summers oppressive stranglehold. That is why, to this day, besides Unagi (eel), there are those who eat Udon (wheat noodles), Uri (gourd), or Umeboshi (salted plums), on DOYO NO USHI NO HI. 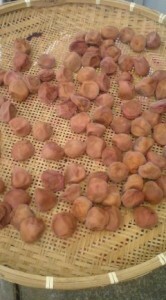 Today, I stopped by at an eel restaurant, and they were serving DOYO UME- plums for DOYO along with their unagi. The man who is credited with having made eel into THE food to be eaten on DOYO NO USHI NO HI is the polymath Hiraga Gennai (1729-1779), one of the more interesting characters of pre-modern Japan. The story goes like this. An acquintance of Gennai who ran an eel restaurant had fallen on slow times. To help whip up business, the well-known and well- loved inventor, writer and artist wrote up a sign for the shop saying that it was the Day of The Ox During Doyo (and a good time to eat unagi, which begins with a U !) The sign was a big hit (as you can now imagine) and thus was begun, along with Valentine chocolates and Christmas cakes and chickens one of the greatest commercial successes linking a particular product with a special day. 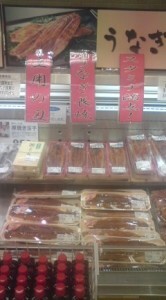 Eating eel DOES make sense though, for the Japanese in summer, since it is HIGHLY NUTRITIOUS. In fact, in Japans oldest collection of poems (The Manyoshu) there are two poems on the theme of eating eel to prevent SUMMER WEIGHT-LOSS, by one of the greatest Japanese poets of all time- OTOMO NO YAKAMOCHI. Something else to consider is that another obvious choice for a nutritious dish on the Day of The Ox would be BEEF. Pre-modern Japanese , however, did not eat animals with legs (mostly) and thus cows were not eaten (eels, on the other hand, are just about as far as you can get from having legs!). So, there you have it. 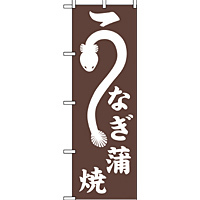 This years DOYO NO USHI NO HI is coming up, so while you should have no trouble finding eel at supermarkets, you WILL have trouble getting in the better UNAGI RESTAURANTS ( especially on the the 21st this year). It is interesting to note that in the Kansai Area ( around Kyoto and Nara) the eel is only grilled and NOT steamed. I cannot tell you how it is prepared that way, as I have never eaten unagi in Kansai! 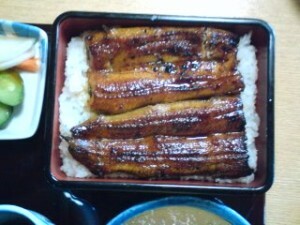 Another way of preparing eel that I would like to try is SHIRAYAKI- which is eel steamed without the sauce. another friend, who is something of a gourmet has told me that UNATORO is delicious. This is pieces of eel mixed into grated yama imo ( a kind of tuber) poured over rice. Sounds deeeeelish!